How can you tell if a hedgehog is blind? I’ve only personally encountered three blind hedgehogs in over six years of hedgehog rescue but I’m often asked this question by other hedgehog rescues. Sometimes it is obvious that the hedgehog is blind because it will have no eyes at all due to injury or disease. One blind hedgehog had opaque eyes that were tinged blue. It was likely born that way. With others, it can be less obvious and takes a number of steps and tests to diagnose. Hedgehogs mainly rely on their sense of smell and so they can cope well without one eye and can be released to the wild. This is not the case for a completely blind hedgehog. These are some of the tests that can be used to help diagnose blindness. These should always be undertaken alongside a diagnosis from a vet and working closely with an experienced wildlife rescue. 1.Vet test of the eyes to check pupil reaction to see if they react normally. This check will also look at any abnormalities in the eyes eg cataracts or injury. 2. Setting up an obstacle course to see if the hedgehog is able to easily navigate around obstacles. Heathcliffe (pictured) ran up to walls and bumped into them and was not able to identify shallow steps. Over time, a hedgehog may learn to navigate obstacles as the location becomes familiar so it is important to observe this behaviour early on. 3. Behavioural observations. A blind hedgehog will often come out in the day when it is first released into an outdoor enclosure. Over time they can become accustomed to the difference in temperatures between night and day (enabling them to exhibit more normal nocturnal behaviour) and so it is also important to monitor this from the start of them being placed outdoors. When I was inexperienced, I released a hedgehog in my garden thinking it was normal. I couldn’t understand why I kept seeing it coming out in daytime, even though it was free of parasites and injuries that might otherwise cause this behaviour. In fact, he was completely blind. 4. Use of the nose and vocalisation. In my experience, blind hedgehogs use their sense of smell more. They may walk with their nose higher in the air – like Heathcliffe (pictured) and may sniff the air more than other hedgehogs. They may also be noisier in their snuffling compared with other hedgehogs – almost like they are using this for echo-location. Of course, this requires a good knowledge of ‘normal’ hedgehog behaviour! Heathcliffe trying to find an escape route from his enclosed garden. He is blind but he knows someone is there due to a combination of smell and sound. So what happens to blind hedgehogs? This is where it gets contentious. The welfare of the animal and laws around captivity of wild animals are, of course, paramount. For this reason, some wildlife rescues will put a blind hedgehog to sleep. I have released all 3 blind hedgehogs to enclosed gardens. These are sites where I am confident that they will receive a good quality of life and be able to exhibit natural behaviours. They learn their way around the enclosed areas and are able to forage naturally for food, as well as being given supplementary food. Enclosed gardens should not have heavy foliage, such as ivy, growing up the walls. Hedgehogs (even blind ones!) are very good climbers and can climb the foliage and escape. Hedgehogs can live for many years in captivity and so this care needs to be provided indefinitely. I run a hedgehog rescue in York. My work is entirely self-funded. You can read more about me and my work here. You can also find out how you can support my work here. 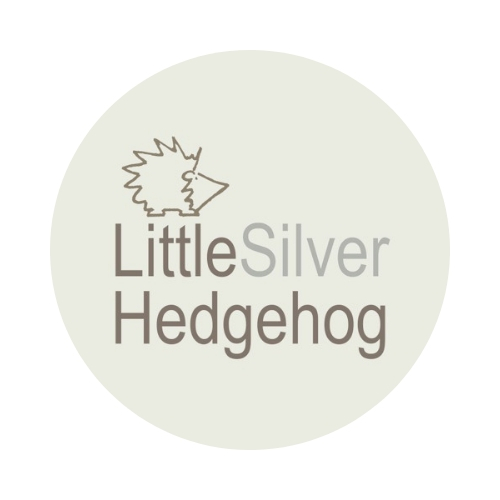 I make handmade silver jewellery inspired by nature and wildlife to raise funds for my hedgehog hospital. You can visit my online jewellery shop here. Your photo is almost identical to many that I took of Lucy Lu, one of the three blind hedgehogs that used to live in my enclosed garden.